What a poignant statement that is. 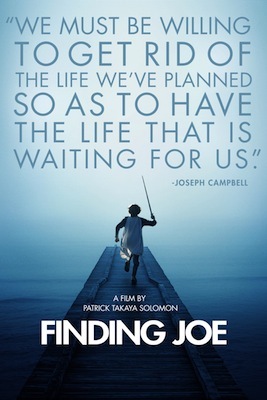 When I was working with Lydia Smith, helping with the Camino Documentary this past March, she recommended watching ‘Finding Joe’. This is a DVD which explores how the Hero’s journey is relevant and essential in today’s world. It discusses how to live a fully realized life. Finally I carved away some time from my day to view this DVD. During the 80 minutes of the film, I sat transfixed to the screen. It was so very evident there was such a strong parallel with my life and what was being explained in the film. The Hero’s Journey, as it was being described, is my story. It explained my need, my desire to be close to and a part of the Camino de Santiago. Separation – the Universe inspires you to take a journey, sometimes gently and other times quite strongly. This can be explained as a ‘calling’. You are made to step outside your comfort zone. Initiation – you are placed into another place unfamiliar to you. There will be obstacles placed in your way, you will be challenged. You must fight your demons and conquer them. Once this is completed you will find true self-redemption. Return – you return to your original place as a changed person to share what you have learned and give back to your community. My Separation – I can’t tell you what first inspired me to walk the Camino. I can say my inspiration originally came from a Rick Steves’ travel show. But why, I hated travelling alone, in fact I was afraid to travel alone. What caused that burning desire to become a pilgrim? It wasn’t for a religious purpose, I did not feel the need to walk a pilgrimage for atonement, and in fact I didn’t think of the Camino as a pilgrimage at all. Yes, I know it is one of the three original pilgrimage routes in the Catholic religion, but that was not my intent. I now believe this was my call to adventure. My Initiation – Oh, yes I was confronted by many dragons on that first Camino. But the largest, strongest, most fearful dragon was the hardest to overcome. That dragon was my irrational fear of being alone, travelling alone, walking alone, not having anybody to befriend me. That particular dragon was so strong that upon arrival in St. Jean Pied de Port, I immediately aligned myself with another woman who was also alone. She and I shared hotel rooms, dinners and sometimes walked together during the day. It took several weeks for that alliance to end. Why? Simply because I was unable to fight the dragon, I didn’t have the courage I needed to do so. My Return – When I returned to the States, I began the Old Pueblo Chapter of American Pilgrims on the Camino. I am giving back to our community by providing support and a forum for other pilgrims to learn about the Camino de Santiago. But immediately I was being called back to the Camino, there still was more for me to do. I knew I would return, just didn’t know when that would be. As it turned out, my second Camino was only one year later. The third followed six months after my return and my fourth will begin in less than two months, 3 months after my return from the third Camino. Before my first Camino, my life had become devoid of adventure, it was like being on a treadmill, and it was predictable. I had lost contact with my soul. My life was wrong. I had bargained away my life for the security of avoiding my fears. Fear is such an inhibitor – I was holding myself back from doing and achieving all of my dreams. I had a need to become the hero of my own life not the victim of it. I have learned that I have a choice and only I am responsible for the way my life plays out. I had to summon up the courage to explore the unknown. I had to find a place where there was joy so that joy could burn out all the fear I held inside. That place for me was and continues to be walking the Camino de Santiago. My Hero’s Journey was not easy. I learned my greatest obstacle was me all along. Now, I am following my bliss! I have found my sacred space and I plan to return there again and again.